If you’re like me, you are probably feeling a deep sorrow in your heart over the news that oil will soon flow through that black snake of death, the Dakota Access Pipeline. 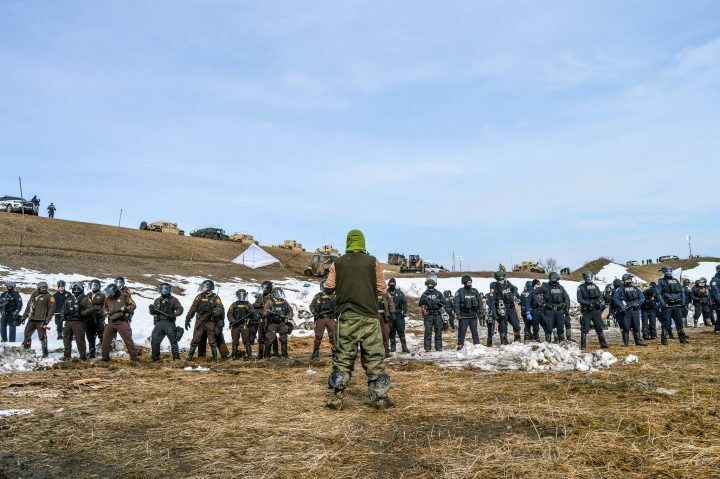 Despite the largest gathering of tribes in over 100 years, despite the prayers and militant resistance, despite hundreds of water protectors facing trumped up felony charges, despite the occupations, blockades, lockdowns and sabotage; DAPL has prevailed. It is true, we lost the battle of Standing Rock, but there are signs that we are winning the war on fossil fuel infrastructure. In the past year, as the resistance at Standing Rock grew from a trickle to a flood, at least seven new oil and gas pipelines have been defeated. These include: Pinion Pipeline – NM; Sandpiper Pipeline – MN; Northern Gateway Pipeline – Canada; Northeast Energy Direct – New England; Palmetto Pipeline – GA, SC; Constitution Pipeline – PA, NY. Many of these pipelines were defeated when, seeing the massive resistance at Standing Rock, companies simply withdrew their applications citing “market forces”. What is left unsaid in the corporate press releases is that our resistance to new energy infrastructure is now a major market force. In addition to these victories, the past couple years have seen communities up and down the west coast defeat seven out of eight proposed coal export terminals and four proposed oil export terminals aimed at shipping Bakken crude from North Dakota to international markets. It is important to understand that the fossil fuel industry needs these new infrastructure projects in order to expand. Without them they cannot. While it should have been clear under the Obama administration that the US government was never going to commit to any meaningful greenhouse gas reductions (the US became the #1 producer of oil and gas in the world on Obama’s watch), nobody is under any illusion of the government reigning in emissions under the Trump regime. It is plain to see that our only hope in defeating the fossil fuel industry will not be through government action, but concerted direct action campaigns against these fossil fuel projects. As we lick our wounds, mourn the loss, and continue to support those facing charges, we can find inspiration in the incredible spirit of resistance unleashed by the uprising. While a global divestment campaign has been hitting banks with occupations and blockades, and withdrawing billions of dollars from these fossil fuel funders; a wave of direct action encampments have blossomed in the paths of destructive infrastructure projects across Turtle Island. The Society of Native Nations launched the Two Rivers Camp at the end of Dec. 2016 to fight Energy Transfer Partners Trans Pecos Pipeline which would transport fracked gas from Texas shale fields, through the beautiful Big Bend region, to Mexico where it would be exported on the international market. The camp, which includes support from the Jumano, Apache and Conchos People, has engaged in a series of successful actions to disrupt construction of the pipeline. Sabal Trail Resistance has engaged in a series of direct actions to stop the Sabal Trail project, a 500 mile project by Spectra Energy and Duke Energy to ship gas from Alabama to south Florida. The pipeline has seen strong resistance from members of the Seminole tribe as well as residents and environmentalists living along the route. There have been multiple acts of civil disobedience, including a mass action in January in which 1000 people gathered to shut down pipeline construction under the Suwannee River. Also just last week a lone pipeline resister was killed by police after fleeing the scene of an effective sabotage action against the pipeline. In addition to the ongoing actions of STR, folks in Dunellon, FL have opened up the Water is Life campaign house to serve as a base for anti-pipeline organizing. The Diamond Pipeline would carry oil from eastern Oklahoma to a refinery in West Memphis, Arkansas. In response Arkansas Rising has shut down pipeline construction with direct actions and most recently blockaded the West Memphis oil refinery that would receive the oil. They don’t have a permanent encampment but you stay up to date on their actions here. Members of the Ramapough-Lunaape Tribe have set up a prayer camp in the path of the aptly named Pilgrim Pipeline. This pipeline would bring Bakken crude oil from Albany to the Bayway refinery in New Jersey. A second parallel pipeline would ship refined petroleum products back north. In addition to their encampment, tribal members recently finished an eight day prayer walk to draw attention to the pipeline. From the get go, resistance to this fracked gas pipeline has been strong. Counties such as Floyd, VA have organized such strong resistance that the pipeline company decided to reroute construction around them. Most recently activists organized a direct action training attended by over 100 people including many landowners living on the path of the pipeline. Activists have tentative plans for a week long action camp in June to continue building the resistance. This 163 mile long pipeline would cut through the Atchafalaya Basin, the largest riverine swamp in the US, to bring petroleum to refineries in St James Parish, LA. This pipeline, brought to you by Energy Transfer Partners, the same company behind DAPL, has already faced stiff resistance from Louisiana residents. Members of the Houma Tribe, the Louisiana Bucket Brigades and other concerned citizens have turned out hundreds of people to rowdy public hearings on the pipeline, where government officials have been booed and shouted down. Many activists have said they are ready to start an encampment if and when construction starts. The Atlantic Coast Pipeline, backed by Duke Energy, Dominion Resources, and Southern Company seeks to bring fracked gas from the Marcellus shale into Virginia and the Carolinas to fuel a new wave of gas power plants. North Carolina Alliance to Protect Our People And The Places We Live (APPPL) and the Coalition of Woodland Nations have recently teamed up on a two week long march following the route of the ACP through North Carolina to raise awareness and build a network of resistance to this pipeline. In addition to the walk many landowners are refusing to allow their land to be surveyed and some are vowing to engage in civil disobedience to keep the bulldozers off their land. For the past few years members of the Apache tribe have been occupying an area known as Oak Flats in order to prevent a new copper mine from being built on their traditional sacred land. Thanks to the Sen. John McCain, this land, which was relatively protected under the control of the Forest Service, was given to Resolution Copper by sneaking a rider into a Defense Authorization Bill. The occupation, under the name Apache Stronghold, is still ongoing and vows to stay until the project is defeated. This February, residents of Lancaster County announced the launch of Lancaster Stand, a protest encampment built directly in the path of the Atlantic Sunrise Pipeline. This pipeline would carry fracked gas out of PA and send most of it to the controversial Cove Point LNG export terminal in Maryland. So far the camp is holding strong and encouraging others to join them. Members of the Gitxsan Nation have erected a camp to fight the PRNGP and accompanying LNG export terminal. The pipeline and export terminal threaten their traditional territory and vital salmon runs which the First Nations people have relied on for countless generations. Like the Unist’ot’en they are using their camp as both a base of resistance as well as a space to pass on their traditions to the next generation. In response to a proposed $11 billion LNG export facility on their traditional territories, members of the Lax’walams Nation have camped out on Lelu Island to block construction. The facility would have a major impact on the coastal ecosystem, including salmon runs, that residents depend on. The resisters have intercepted ships carrying surveying equipment and disrupted other efforts to begin construction of the LNG facility. All power to the Camps! Supporting, growing, and escalating these direct action encampments should be a primary strategy for our movement to defend the Earth and her people. Not only do they serve as a base to launch disruptive actions against destructive projects, they also act as radical laboratories where new ideas and tactics are innovated, as well as focal points where new and inexperienced activists can dive in to a full blown direct action campaign relatively quickly. These camps help us to grow a culture of resistance by creating communities where we can experiment with self organization and autonomy, pointing a way forward out of the utter inneffectiveness of electoral politics. These spaces allow us to break through the isolation of social media activism, and find each other in real life to build bonds, make connections, and take meaningful action in defense of Mother Earth. There are many ways to help these resistance camps thrive: donate money and supplies, organize work parties, do solidarity actions, spread the word with a presentation in your town, broadcast them on social media, and of course you can always join them, or better yet, start your own!